You can catch a falling star in this adorable retro dress features with a full skirt and functioning pockets! Ruched bust. The dress comes with terrible wrinkles that can be worked out in a dryer. It's not at all shiney like the picture shows. But it's still beautiful. Fits like a glove. 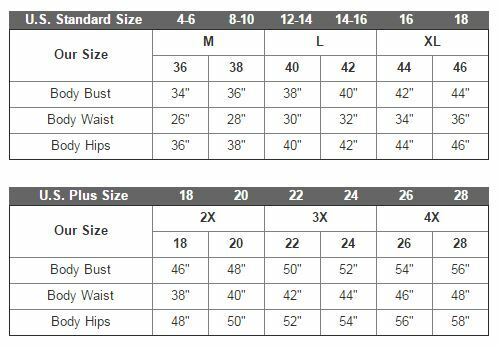 When you look at the chart, make sure you know your sizes to the t. If you don't want it skin tight, get the next size up. Because those measurements were exact. Fit me perfectly. Very flattering, but not exposing. I received this dress as a Christmas present - it fit me perfectly (2X), and I wore it for a Valentine's concert with a red petticoat. I LOVE the super-full circle skirt and the roomy pockets. My one small issue is that I wish the fabric weren't so wrinkle-prone, but other than that it's a great dress. Cute, but should've gotten a couple sizes bigger. My fault. Now I know what size to order next time.